I am that guy that always wants to share what I am reading, watching, listening to, etc. Sometimes I just want to give everyone a heads up about something cool they may have missed. I had a brief period of believing I was an activist. I was swept away by a few of my friends who were deep within the Black Lives Matter Movement here in Denver. I found myself disoriented and in many ways I am still unpacking the impact of those few months. One question I found myself asking over and over again was “What now?” I was not content allowing my Black Lives Matter experience to sit on a shelf in my mind and become some anecdotal story I could bounce back to from time to time. I felt like an entirely new world had burst into my consciousness and I knew I needed to take some kind of a “next step”. It was around this time that I listened to one of my favorite podcasts. Krista Tippett was interviewing a few people, including Maya Angelou, about a book and man I had never heard of–Dr. W.E.B. Dubois’ ‘The Souls of Black Folk’. Their conversation convinced me that this book was the answer to my question of “What now?” So I picked up a copy and began reading it alongside a friend. The conversations that have come out of doing this are still happening and are packed full of more grace and beauty than a simple blog could communicate. I just finished the book and decided I would do my best to articulate why it is one of the most influential things I have ever read. My one disclaimer is that I want to share this with you, and I also feel incredibly out of my league in doing so. I am going to be speaking out of my ignorance as much, or more, as out of my knowledge after having read the book. As a white man, I am not sure I am truly capable of understanding this work and all it contains. Dr. W.E.B. Du Bois was born in 1868. He wrote ‘The Souls of Black Folk’ in 1903. For those of you not super brushed up on your American History, he wrote this book exactly 40 years after the Emancipation Proclamation was signed. His context of writing sat with great tension between the Emancipation of somewhere around 4 million men, women, and children who were enslaved and the Civil Rights Movement of the 1950’s and 60’s. This is a period that almost felt non-existent in my history studies. It seemed that the narrative felt something like: “Slavery ended, then came Dr. King…and now racism is over.” This short, but incredibly dense book offered a dramatic picture of what life for the Black community was like between Emancipation and “I Have A Dream”. Dr. Du Bois was a poet and scholar and this book reflects the depth of both of those realities. It seems that his mission was to, on one hand, make a case for the inclusion of the Black community in the shaping of American culture. In fact, he pointed out some ways this was already happening. On the other hand, another clear objective was to illuminate the evil barriers Black folks were coming up against that the white community was blissfully ignorant, or even gleefully supportive of. And throughout the book, he deeply affirms the beauty, strength, wisdom, and love of the Black man and woman–against strong belief to the contrary. He illuminates how White America–including the majority of Christianity–is complicit with the harsh reality he is describing. He tells stories that are sure to trouble you, sure to inspire you, and sure to leave an imprint of his struggle toward freedom for his people on your heart and mind. The one line I have shared with my friend over and over again as we discuss this book is that I am struck by how everything and nothing has changed in our country since 1903. It is impossible to read this book and not walk away with a sense of gratitude for how we as a country have progressed toward a greater understanding of racial justice. But it is also impossible to walk away without a clear awareness that in many cases the struggle is exactly the same and it feels like reshaping language has been called “progress” while the open wound of injustice continues to fester. I hope that you will read ‘The Souls of Black Folk’. In many ways it feels like the words of this moral and intellectual giant are more relevant to us in 2016 than they were when they first found themselves on the page in 1903. A few years ago I met a woman who brought with her an impressive amount of positive energy every time she brought dinner to our folks at Joshua Station. Her name is Kathy Escobar. Kathy co-pastors a church in the North Metro Area called The Refuge. There are many things that make The Refuge unique, but I want to focus on the one that helped give birth to one of my new favorite podcasts, Faith Circus. Kathy co-pastors The Refuge with her long time coworker and friend, Karl Wheeler. What makes this fact a little wonky is that Kathy is a “Progressive Christian” often under fire from the more conservative among us, and Karl is an “Evangelical” who holds to some of those more conservative beliefs represented by those folks Kathy hears from on the regular. Now to be fair, Karl is not super conservative. He’s Egalitarian for one thing. That makes him a target as well. But he is decidedly Evangelical and often finds his beliefs and preferences at odds with Kathy’s. They often disagree over some pretty big issues, issues that would usually send a church right into a good old fashioned split. But instead they have decided to co-pastor! They are setting an example of what Unity without Uniformity really looks like. Faith Circus is their podcast. It’s filled with wisdom about how they have managed to hold this tension while not only working together, but maintaining a deep friendship. It’s also filled with some honesty…honesty that honestly makes me uncomfortable for them as I listen to the conversation. Their podcast offers a look into something beautiful that is happening in our city–something I can honestly say I’ve not seen anywhere else. I’ve picked my favorite episode so far. The podcast is really new, so I am sure I’ll be sharing others in the future! Go ahead, give it a listen! For a few years I have been a part of a community in Denver, a community so rich that I rarely walked away from interactions with these folks without something profound to chew on for months to come. I often found myself mourning because I didn’t know how to harness this richness and share it with my friends beyond our city. Well, that time has come. Delve Denver is a podcast put together by our Executive Director at Mile High Ministries, Jeff Johnsen, alongside our Communications Director, Brian Rossbert. The podcast is a way that we are attempting to seeking the “Soul of our City”. This is the first season. Jeff and Brian have played with a few ideas of what this podcast is going to become, but even the episodes that represent this playful exploration are filled with a sort of richness that captures what I have mourned not being able to share with you before. The episodes range from extremely interesting historical stories to interviews with some of Denver’s most important voices–folks that have helped shape the Soul of our City in profound ways. I encourage you to listen to all of the episodes, but I want to share with you my favorite. It’s an interview (broken up into two episodes) with John Hicks and Ryan Taylor. John and Ryan used to co-direct the Network Coffee House until Ryan took over the full responsibility recently. These two funny contemplative guys offer an insight into Network, their work, and what it truly means to encounter folks who have been marginalized in meaningful ways. I discovered the beauty of a good podcast about a year and a half ago. Since then I have subscribed to a few good ones. Most recently, thanks to a friend who was visiting, I have stumbled upon The Liturgists Podcast. The Liturgists consist of Michael Gungor–of the band, Gungor–and Mike McHargue aka “Science Mike”. They also enjoy having guests join them in discussing a variety of topics that are engaging and honestly just pretty fun to listen to. Some of their guests include Rachel Held Evans & Rob & Kristen Bell. The first episode I listened to was a great one packed full of deep insights, challenging questions, and good humor. Listen to the trio (Michael, Mike, and Rachel Held Evans) talk about being (or not being) prophetic, Black Lives Matter, LGBTQ Rights, and a few great bunny trails. Heads Up: What Exactly Is Black Lives Matter? In the fall of 2014 many of us began seeing #BlackLivesMatter on our facebook and twitter feeds. We began hearing those words on tv and we probably began diving into conversation sparked by those words among friends and family. A year and a half later these words are still being uttered and they have served to initiate conversations ranging from civil to downright hostile and from the dinner table all the way to the national platform. What began as a hashtag has undoubtedly evolved into a movement, while more and more people are asking the question, What is Black Lives Matter? I was first introduced to the movement (as opposed to simply hearing the words or seeing the hashtag) in the Winter of 2014. Through that experience I had learned a few details, like the fact that BLM started in the wake of Trayvon Martin’s death as opposed to Mike Brown’s death as is popular understanding. The movement is founded on the principles of Non-Violence consistent with Dr. Martin Luther King Jr. And there is a deep commitment to interrupt our nations attempt to continue on with business as usual in order to draw attention to what many see as a systematic targeting of Black lives in our criminal justice system, as well as other areas of our society. Still, I have a lot to learn. My desire to understand has kept me reading, listening, watching, and trying to resist the knee-jerk reaction to defend my ego as I am faced with the reality of my own complicity in what Black Lives Matter exposes to us as a nation. I want to share two podcasts that I found incredibly helpful along my journey to understand Black Lives Matter. I encourage you to listen to both, regardless of your feelings toward Black Lives Matter. I once heard someone say that his goal with his friend with whom he disagreed was to “achieve disagreement”. When it comes to Black Lives Matter, let us work toward achieving disagreement rather than basing our back and forth attacks on misinformation and popular rhetoric. These two women, Patrisse Cullors and Opal Tometi, along with Alicia Garza worked together to found Black Lives Matter. These podcasts offer us the opportunity to hear more about their heart, inspiration, and what lies at the core of this movement they birthed. Krista Tippett’s Interview with Black Lives Matter Co-Founder, Patrisse Cullors. Rob Bell’s Interview with Black Lives Matter Co-Founder, Opal Tometi. A little more than a year ago a friend of mine told me about this podcast that I needed to check out, because I would love it. He helped me get the app on my phone and I listened to my first episode of On Being with Krista Tippett during my evening commute. Since then I have probably listened to more than 30 other podcasts. This might be my favorite of the podcasts I listen to on a regular basis. Krista is a brilliant interviewer and interviews some of the most fascinating people–from Denver local prominent pastor, Nadia Bolz-Weber to retired South African Anglican Bishop, Desmund Tutu. She interviews a variety of people from all sorts of religious, professional, and artistic backgrounds. I’ve listened to fascinating interviews with Scientists, Buddhist Teachers, Christian Pastors, Muslim Imams, and Artists from all walks of life. If you are looking for a clearly professional podcast to help you learn from those doing meaningful work in our world, you would love On Being. As I think back to all those episodes, I think my favorite might be the interview with one of Mile High Ministries’ friends, Fr. Greg Boyle. Give it a listen and let me know if you fall in love with this podcast like I have! A couple years ago I blogged about my desire to add more books written by women to my library. I had begun to see that my worldview was overwhelmingly shaped by the writings of men and I wanted to change that, so I asked for help from my online community. One of the first names that was sent to me was Rachel Held Evans. I had already discovered Rachel’s blog and really liked what she had to say, but I decided to add her name to my list of authors whose books I would be intentional about reading. Well, it took me nearly 2 years, but I finally made it happen! I picked up her latest book, Searching for Sunday. The primary thread that runs throughout this book for me is a nearly eerie similarity between Rachel Held Evans’ story and my own. This commonality was found in everything from the youth group games we used to play–like Chubby Bunny, the uncomfortable disconnect that eventually became all too noticeable between myself and the beliefs that used to feel like a perfect fit, the attempt at doing a small church experiment outside of the traditional denominational options, and even falling into the warm arms of a local Episcopal Church called St. Luke’s (though mine is in Denver). Some of those similarities brought a smile to my face, but mostly they served to amplify how much I resonated with this beautiful book. One of the most profound impacts of this book for me was the way it helped to make sense of a part of my story I have been tempted to decorate with exaggerations. I used to believe that the only legitimate reason for leaving my old identification as an Evangelical was a deep wound. I suppose I thought this was the easiest excuse. Everyone would simply hear my story and say, “That makes sense. I would have left too!” But, that is not my story–and apparently it’s not Rachel Held Evans’ story either. My questions and doubts became such a huge part of my inner dialogue that I could no longer simply listen to a sermon and “take it in.” Instead, I needed to pick it apart. I found myself leaving nearly every sermon angry, confused, sad, or a mixture of all three. In truth, I was experiencing what my friend Kathy Escobar calls “Faith Shift.” It was incredibly refreshing to hear Rachel give voice to the fact that deep wounds are not the only reason one might need to leave their church. In a faith stream that emphasizes belief as much as the Evangelical stream does, deciding I believed something different proved too heavy a burden to bear. Like Rachel Held Evans, I eventually found a rhythm of spirituality that honestly nourished my soul without having to hide from those pesky doubts and questions. I have learned to embrace the beauty of mystery and my journey has been nothing short of transformational since. I loved Rachel’s exploration of her journey guided by the Sacraments of Baptism, Confession, Holy Orders, Communion, Confirmation, Anointing of the Sick, and Marriage. There is sometimes a misguided judgment that when someone experiences a disillusionment with their system of belief they become less interested in exploring spirituality. This book is yet another beautiful example of how that is simply untrue. 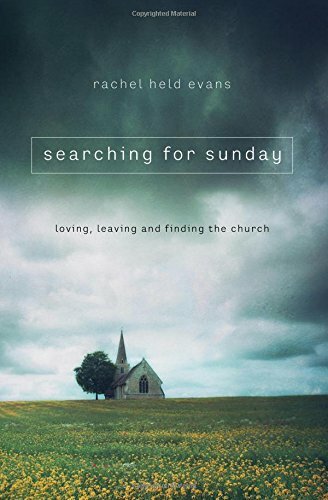 I am truly grateful that I read Searching for Sunday, and if your story resembles my own, I can’t encourage you enough to pick it up. You won’t be sorry!